The sun is finally shining and at last we can add some pastel pieces to our wardrobe. They come into fashion every spring, yet each year there seems to be new key pieces for me to lust over. This year we all were craving the pastel wool coats for fashion week, and now it’s all about adding sophisticated pastel shades to your daily look. My favourite Spring trend has to be the midi skirts (Whistles have some dreamy ones) – even as a shorty they are still surprisingly easy to wear. The light green Emilia Wickstead top is another one of my favourite pastel pieces and exudes retro sophistication, I’d balance the swinging A-line shape with some white tailored shorts or a tight-fitting pencil skirt. My mum actually just treated herself to the Ambow Leather Coat from LK Bennett – it is a gorgeously simple silhouette, collarless with two pockets, and the colour is just beautiful. In Acne Studio’s signature oversized silhouette, the pale pink T-shirt is a wardrobe staple – it is lightweight and laid back and you can wear to build an effortlessly chic casual look. I’d team with tailored white trousers for a work to bar outfit, or with great fitting jeans for an understated day look. I recently treated myself to this Whistles Fit & Flare skirt – it is so beautiful and feminine and very versatile. I team with either a white silk T-shirt or a black roll neck, depending on the weather! An easy way to wear this season’s hottest hue is with these Superskinny pink jeans from River Island, I would team with either a grey silk blouse for a chic day look, or perhaps a white t-shirt with chunky jewellery to match the gold zips; perhaps this attention grabbing opulent statement necklace from Accessorize, and their Luxury Milan Ring. 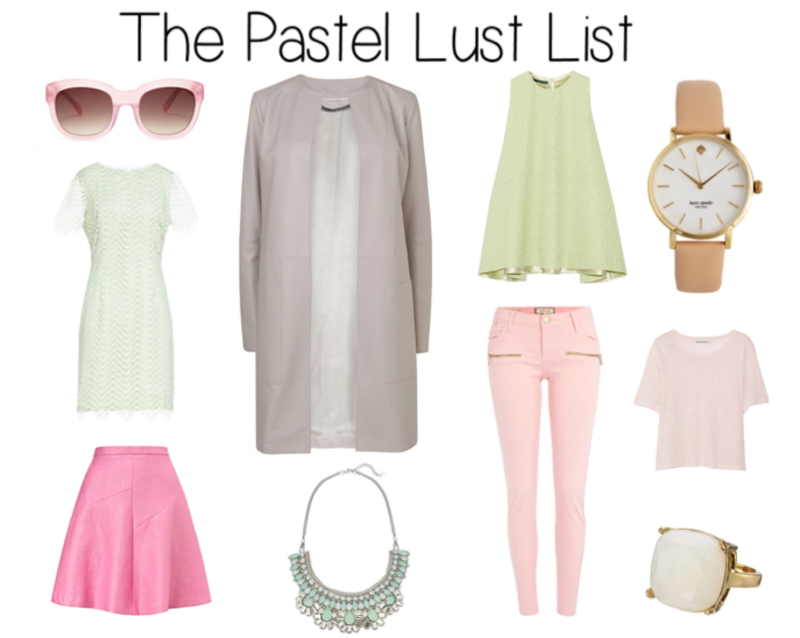 What are your favourite pastel pieces this Spring?